With the 2014 Touring Car World Championships having just concluded in Florida, the sport’s governing body IFMAR have made the announcement that the ninth running of the 1:12 & ISTC Championships will take place in China, with Beijing successful in its bid to host the 2016 event. With the FEMCA bloc also receiving bids from Japan and Thailand, this will be the first time an IFMAR World Championship has been held in China providing a great opportunity for the sport to promote itself in the world’s biggest economy. 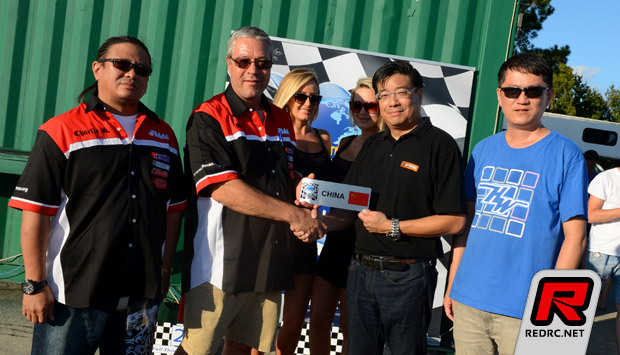 The announcement was made by IFMAR Vice President Bob Ingersol with Rick Wang on hand to represent the race hosts CMAC (Car Modelling Association of China). Well known on the international racing scene, Wang believes bringing the race to China will be good for both the sport and the industry. Set to take place in the Fengtai District, where $15-million is being invested in the Fengtai Science and Technology Center which is set to be completed May 2015, he said within this complex they will build a brand new indoor and outdoor track for the event. With the 2014 event coming in for cristicism for not having a day between the running of 1:12 and Touring Car, Wang said this will happen in Bejing to allow race attendees to visit the city’s world famous sights include the Great Wall. With China having been mooted for some time as a candidate to host the event, concerns were raised regarding Visas with Wang alleviating this by saying as this is a Government backed event this will not be an issue. Last year CMAC hosted its first international event when the FEMCA 1:8 Offroad Championships took place in the Fengtai District with Atsushi Hara taking the win.